Announcement Contemporary handcrafted original designed jewelry for casual or evening wear. Colorful beads with unusual patterns are used to create many different styles. Necklaces and bracelets are shipped in an organza bag free in the US. International shipping is by USPS rates. No handling fee, ever. I am a single senior who is hooked on making jewelry and have been for almost my entire life. When I can tear myself away from my little work space I spend some of my time visiting with family and friends, reading, doing a puzzle, eating, and watching a little TV. But making jewelry is what I really want to be doing. I love making jewelry. I look forward to shopping for new beads and findings to make my jewelry special, different, unusual, uncommon, affordable, distinctive, and pretty. I imagine who might purchase one of my pieces and when they would be wearing it. Some are especially suitable for evening wear, some for a casual outing, or at work and others just for fun, or to make a statement, such as the pink bracelet for Mothers of little girls. I have made several Christmas earrings that are original and won’t be seen anywhere else. My jewelry designs are all originaI, so if you like to be seen wearing something no one else could have my shop is the place to find it. I have handmade crocheted items for babies such as tiny vintage bibs made by my grandmother and booties and a soft afghan in shades of pink and blue suitable for either a boy or girl baby. These booties or afghan would make a great shower, christening, or baptism gift for a happy mother. Some listings have expired but I can re-list any that you might like to see. Jut let me know. You can reach me at mizmlu [!at] gmail.com. My vintage items come from many sources. Quite often I am given pieces that need repair, or come from a long lost relative. I put them back together while imagining the original owner's personality. It takes me back in time reminiscing about the past. I love the challenge of bringing those old pieces back to life. My creations are made with love. I sometimes wear them once before they sell. And many times I hate to see them go. Just creating the various pieces gives me great satisfaction. Most of my time is spent on the design, putting the beads together to best show off their beauty. I am fortunate to have a variety of sources for unusual beads and materials to make into a piece of jewelry. I get most of my ideas from the beads themselves. I have also helped friends to get started making their own jewelry. So... Welcome to my Etsy Store! You have found the place where I display the jewelry I make and the vintage items from my years of collecting “things”. Although sales have been slow these past few months it doesn't stop me from looking for new ideas, new beads, and new ways to promote my Etsy shop. I list almost all my creations on Pinterest and some of them are also available in Classifiedads.com, http://bit.ly/Oh2WzL and sometimes on Ebay. From now on I will be shipping my necklaces and bracelets in Organza pouches. This will make a nice presentation for a gift or just a little protection in your jewelry box. My latest project was turning my guest bedroom into a studio. Prior to doing that I used the dining room table which required me to remove all the jewelry makings whenever I had guests. Since my overnight guests are few and far between I got rid of the bed and converted the room to a workplace. I found an old table that was the perfect size, and purchased 2 large storage containers for my materials. I am very happy with the result. Sometimes I just go in there and dream of my next project. Please take a look at what is available in my Etsy shop. You are there now so see what is currently ready for you. I make sure that your purchase is securely packaged and I don’t charge shipping for most items shipped in the US, as quickly as possible, often the same day as purchased. Please browse through my shop and view the classic, unique designs of MizMlu. If you liked an item but it is no longer in the shop, please contact me at mizmlu [!at] gmail.com and if it has expired but is still available I will arrange for the purchase. Thank you for taking the time to read this and I hope you enjoy looking at my shop! Contemporary handcrafted original designed jewelry for casual or evening wear. Colorful beads with unusual patterns are used to create many different styles. Necklaces and bracelets are shipped in an organza bag free in the US. International shipping is by USPS rates. No handling fee, ever. Bright but not too showy - I like that. Thought the other necklace I ordered would be my favorite but this one has it beat! Will accent many of the darker colors I wear nicely. Thank You! Beautiful color mix. Seller shipped quickly. Thanks! Was hunting for blue rose necklace and this was it. Simple and good for working women to wear to work then to meet friends after hours. Lots of colorful jewelry. If you do not find it here, check Amazon handmade. My youngest daughter, JP, is an accomplished artist who joined Etsy a few years ago. She suggested that I use Etsy to sell some of the vintage items I no longer wanted and the jewelry that I made in my spare time. I thought that was a great idea. And it turned out to be very satisfying. I began by finding those vintage items stashed away including one dating back to the days of the flappers. It originally belonged to a professional ice skater who gave it to my mother who gave it to me. I recently sold it so It now has a new owner. I had been making earrings for years to match the clothes I wore and shopped at the local bead stores for ideas and supplies. So, it was natural for me to expand that hobby into a business through Etsy. I am retired and live alone, so my time is my own. I can spend as much time as I want on making new items so I am able to post them on Etsy very often. I do not have a camera so I must wait for my older daughter to take pictures for me which she does very willingly and enthusiastically. Thank goodness for her. I am now totally addicted. Big time! When I start something I seem to get so involved that it takes all of my time. This happened when I began researching my ancestors. I had a friend who encouraged me to start and once I began I was hooked. That was more than 15 years ago. Since then I have found ancestors back 11 generations. Each time I confirmed one ancestor it led me to search in another direction so it has become a never-ending pursuit. I have written genealogical articles for publication, made books and CDs with pictures and history for my family and helped others begin their search. I love to get someone else as hooked as I am, so I give them lots of suggestions on how to get started. Making jewelry is perfect for me. I am an artist at heart but cannot draw, so I have never pursued that activity. But I can make jewelry. 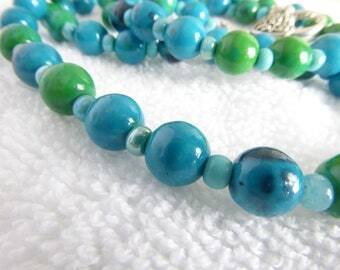 I love to fiddle with the beads until I get just the right combination of colors and style. Sometimes it takes several attempts before I am satisfied. If I would buy it and wear it, I make it. In fact I often wear something that is up for sale on Etsy and always get compliments. I am thrilled when someone favors one of my pieces and always thank them as well as seeking their site. I have found some incredibly beautiful items on Etsy shops. There is so much talent to be found on Etsy. Recently I decided to convert my guest bedroom into a studio, so that I could work without having to remove all the beading materials off of the dining room table when I had guests. I found a perfectly sized table and bought 2 storage units and I am in heaven. Should have done it a long time ago. I would like to post a picture of my "studio", but have to wait for Circe to photograph it. I love searching for new beads and findings. I order beads online and in 3 different bead shops so I have lots of choices. I just purchased organza bags to use for my jewelry sales. All my jewelry will be shipped in one of these bags at no extra cost. This will make gift giving more attractive. Hope you will find them as pretty as I did. I will continue to make jewelry and post it on Etsy as long as I can. It is so satisfying for me that I will never stop voluntarily. Chief designer for this, my MizMlu Creations, Etsy store. I have a penchant for simple and unique design. I create from scratch and no two pieces are identical. I am an old-school shop owner. I believe you should get your purchase ASAP! Circe has been my photographer since I joined Etsy. She is a computer expert consultant and author, but has now begun to design her own style of jewelry. We frequently shop for supplies together and she is now placing her designs on our Etsy store. JP is my youngest daughter. She was an Etsy seller of her own designs and encouraged me to join. She designed both of the banners I use in my 2 shops and we share advice on promoting our Etsy items. Eve and I have been friends for more years than I would like to count. She and I frequently consult on handcrafted items and how best to display them. I am proud to include any of her handmade items in my shop. Handcrafted original designed jewelry for casual or evening wear. Colorful designs with unusual patterns are available in many different styles. Necklaces and bracelets are shipped in an organza bag free in the US. International shipping is available by contact. Payment is by PayPal. You may pay with major credit card through PayPal. No checks, money orders accepted. Sales tax is applied to sales in California. I ship within 1-2 business days. Shipping is free in the US via USPS, unless customer requests a different method which will not be free. International sales are shipped after customer has identified country and accepted shipping cost.